I had an accident this afternoon while I was in Houston having lunch with a friend. Fortunately, no one was hurt except the driver’s door of my BMW Z4. About an hour after the accident, I placed a call to Geico’s toll-free customer service line. I wasn’t sure if I’d get a live person on a Sunday afternoon but I gave it a shot. After two or three rounds of ‘press 2 if you’ve been in an accident’ and so on, I was connected to Aaron, a live human being. Aaron sounded like he was here in the U.S. I don’t mind when companies outsource their customer service as long as there’s a clear connection and there’s not an accent too thick to understand. Aaron scored well on both points. Over the next ten to fifteen minutes, Aaron asked questions about me, the other driver, my car, my witness and got a brief description of what happened. He also did something that surprisingly few company employees seem to do these days, apologize for any inconvenience. Next, Aaron gave me a claim number and a special call-in number that he told me was available 24/7. He then asked if it was okay if he also contacted me via email. When I agreed, he asked for my email address. Before we even got off the phone, an email arrived with the same contact info and claim number. Aaron explained that he’d be handling my case and that he’d follow up with the other driver so they could determine liability. He promised to get back to me as soon as possible. Within 45 minutes, Aaron called me back to let me know that he’d spoken to the other driver and to let me know that he had a couple of different options for me to get my car back in pre-accident condition. First, Aaron gave me the location and number of a body shop that was within 5 minutes from my apartment in Dallas. He told me that if I could take my car in at 10 AM tomorrow morning, they would do the estimate and then immediately begin work on my car. A rental car would be there at the body shop waiting for me when I arrived. He also let me know that if 10 AM wasn’t convenient, they could see me at the same time on Tuesday or, if an afternoon appointment would be more convenient, 1 PM on Tuesday. Second, he told me that if I preferred to take my car to another body shop, I could. If the body shop had a relationship with Geico, everything would be covered. If not, I’d have to pay the body shop and then be reimbursed by Geico. When we agreed on an appointment time and ended our call, I immediately received two emails. One confirmed the appointment at the body shop and gave me their address and contact info. The second confirmed the rental car reservation and info on who to call if I had any questions. First of all, I’m pretty impressed that within less than an hour of my calling in on a Sunday afternoon, Geico had taken care of everything and repairs on my car could begin the following morning. I also liked the fact Aaron was courteous, clearly explained everything, and had the foresight to check on alternatives in case the initial appointment time was inconvenient. (It wasn’t so that prevented a round of phone tag). Want to hear something even more impressive? I’m not a Geico customer. The accident was the other driver’s fault and Geico is his insurance company. It turned out that I happened to call in before the other driver but that didn’t prevent Geico from being proactive and getting the ball rolling. After my initial call, they reached the other driver, got his story, determined it was his fault, found a body shop convenient to my location and got available appointment times and reserved a rental car. All this on a Sunday afternoon. So score one for Geico. Now I’m just wondering whether it will be the green lizard or the caveman that delivers my rental car. So when is the last time you got this kind of customer service? Nice story with a happy ending. Bummer about the Z4- glad it’s going to be ok.
Jim, I’ve been with the same insurance company, Farmers, for 20 years and I’ve yet to make a claim so I don’t know what their customer service is like but my agent takes good care of me. But I’m happy to have a company to praise rather than one to complain about. Pat, it could have been a lot worse. I was about the get out of the car to come around and give TC a hug. Glad I didn’t. Sorry about the BMW, Bill, but glad to know you’re okay. I spent the weekend in Dallas and was thinking of you, but knew you were in Houston. Hope to see you soon. Meanwhile, we just got a policy with Geico, and I’m really happy to read your positive report! Sorry I missed you in Dallas. Glad you’ve got a good insurance company and hope you never actually have to use the claim service. A quick follow-up. This morning, The Geico Gecko (@TheGEICOGecko) tweeted a greeting after seeing me Tweet the link to blog post on Twitter. Good to know Geico is on top of their social media. And any individual or company should monitor what people are saying about them and, if appropriate, responding. What’s your strategy for using social media for customer service? ✔✔✔ I’am happy you where able to fix your car! My luck was not so on my side with geico! they refuse to fix my car damages on my chevy tahoe on a backing up parking lot accident. geico favored their insured statement, leaving aside the obvious evidence that it was clear that it was his fault, from backing up from his parking space and not paying attention ! 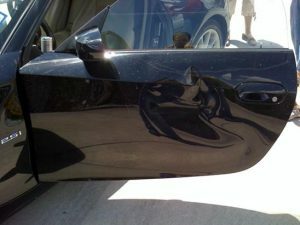 $4700 on damages just to fix both front hand back doors passenger side of my tahoe! Geico refuse to fix! TWO thumbs Down for Geico if you ask ME!!! !